FORT LAUDERDALE-DAVIE, Fla. – Studying coral reefs, what makes them tick and how we can help protect and safe these maritime wonders is something Nicole Fogarty, Ph.D., has dedicated her life to. As a researcher at Nova Southeastern University’s (NSU) Halmos College of Natural Sciences and Oceanography, Dr. Fogarty and her collaborators at Penn State University have received nearly $1.1 million via a three-year grant from the National Science Foundation. In a nutshell, what the team will be looking at is why hybrid corals are thriving when their parental species remain threatened. Research has shown that the once dominant staghorn and elkhorn corals have declined more than 90% since the 1980s, primarily from disease. Reef-building acroporid corals are the foundation of shallow, tropical coral communities throughout the Caribbean. “This continued decline jeopardizes the ability of coral reefs to provide the many societal and ecological benefits, including revenue from seafood harvesting and tourism, as well as shoreline protection from extreme wave events caused by storms and hurricanes,” Dr. Fogarty said. This project is fully funded by grant number 1538469 from the National Science Foundation. According to Dr. Fogarty, despite legislative efforts to protect staghorn and elkhorn corals, threats to their survival remain pervasive. But what she has found is that hybridization among these closely related species is increasing and may provide a way for adaptation to the changing environment, which could be a factor in why the parental species is still struggling. In fact, some evidence suggests that the hybrid species is more disease resistant than the parental species – which shows potential for rescuing the threatened corals when hybrids mate with the parental species. Dr. Fogarty will be working with Drs. Iliana Baums and Webb Miller from Penn State University to collect genetic and ecological data to better understand the mechanisms that are contributing to the increased numbers of hybrids in some Caribbean locations. The goal is that the information and knowledge that results from this study can help create a more strategic management of coral populations under current and emerging threats to their survival. Dr. Fogarty’s research focuses on the ecological and evolutionary questions related to the reproductive success of broadcast spawners. She is particularly interested in how density dependent mechanisms of reproduction will influence invertebrate population recovery as well as spawning synchrony, reproductive isolation, and speciation. 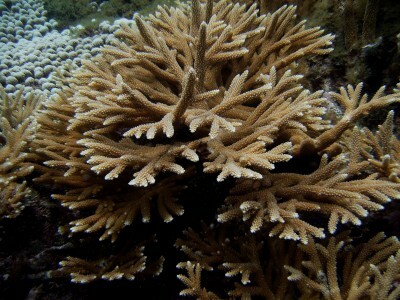 Previous research projects have been conducted in the following areas: coral hybridization, pre- and postzygotic isolating mechanisms in corals, polyspermy in sea urchin and corals, clonal structure of corals, the genetics and pheromones involved in corals spawning synchrony, threatened coral demographics, exogenous hormones and pollutants on sea urchin fertilization and larval viability, coral settlement under a variety salinity regimes, natural settlement in the Dry Tortugas, coral chimeras, and the use of fluorescence in coral recruit detection. You can see an episode of PBS’s series Changing Seas on the topic of coral hybridization HERE (http://www.changingseas.tv/episode501.html). About Nova Southeastern University (NSU): Located in beautiful Fort Lauderdale, Florida, Nova Southeastern University (NSU) is a dynamic research institution dedicated to providing high-quality educational programs at the undergraduate, graduate, and first-professional degree levels. A private, not-for-profit institution with more than 24,000 students, NSU has campuses in Fort Lauderdale, Fort Myers, Jacksonville, Miami, Miramar, Orlando, Palm Beach, and Tampa, Florida, as well as San Juan, Puerto Rico, while maintaining a presence online globally. For more than 50 years, NSU has been awarding degrees in a wide range of fields, while fostering groundbreaking research and an impactful commitment to community. Classified as a research university with “high research activity” by the Carnegie Foundation for the Advancement of Teaching, NSU is 1 of only 37 universities nationwide to also be awarded Carnegie’s Community Engagement Classification, and is also the largest private, not-for-profit institution in the United States that meets the U.S. Department of Education’s criteria as a Hispanic-serving Institution. Please visit www.nova.edu for more information. Categories: News Releases Tags: Halmos College of Natural Sciences and Oceanography, Hybrid Corals, National Science Foundation, Nicole Fogarty, Ocean, Ph.D.